When it comes to training, I'm always keen to capitalise on the time I have and get the biggest gains for the minimum amount of effort. Biggest bang for my buck. That's why I've always loved indoor cycling classes (aka spinning). Not only is the action of indoor cycling, very closely related to my favourite sport. The fact that you can judge the intensity of your 45 minute workout by the pool of sweat on the floor is also a big plus in my book. You arrive in dry clothes, you leave in wet clothes. Simple. I know women aren't supposed to sweat and all... we just perspire... so I shouldn't really be talking about sweat on here! However, there's no denying it, sweating is a key indicator of a good training session and whether male or female, we love it. I'm really pleased to introduce my newest partner - Cyclebeat, a fantastic indoor cycling studio based in Bank, London. Having spent my working life building and growing startups, I'm always on the lookout to support young, innovative and fast growth companies. It's important to me that both my partners - SportPursuit and Cyclebeat fall into this category. Although, if Carlsberg or another global beer company were to come knocking on my door offering to sponsor me, I wouldn't say no. If Carlsberg made cyclists... I've had this dream many times! Back to Cyclebeat. There's no beating around the bush - I love what they do. 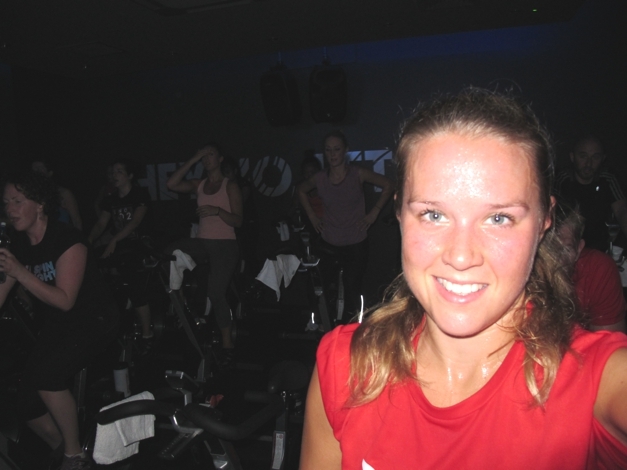 High intensity, indoor cycling classes - done and dusted in 45 minutes. Motivating instructors, welcoming staff and a great location. Above all, the highlight of each session is being able to track, measure and improve my performance on their Beat Board. Throughout each session you can see all your energy, speed and calorie stats on your bike and compare them to others in your class. You can also login to your account and compare each session you've been to. Improving fitness and performance is my biggest motivator, which is why Cyclebeat was a winner from the first session. All their customers are affectionately named "BeatNiks" and they have a monthly Race Night when you can compete for the Green Jersey. Gareth is my favourite instructor and also runs the studio - legend! Sometimes I go for one class and then decide to stay for another, can't get enough of it! That's 1 1/2 hours of spinning before 9am. Result. Cyclebeat currently offers a trial of 20 days for £20. If you live in London and want to get fit, lose weight or give indoor cycling a go - check them out. Older PostIronman Wales - Race Day!